We got home the night before Mother's Day. We were really tempted to stay in AZ one extra day, but we decided to go back so we could spend the day with Cameron's mom. Sunday morning Cameron got up with Cade so I could sleep in a little longer. I woke up to breakfast in bed, a boquet of tulips, a card signed by both Cameron and Cade and a Dove chocolate bar, yum! Thank you Cam! 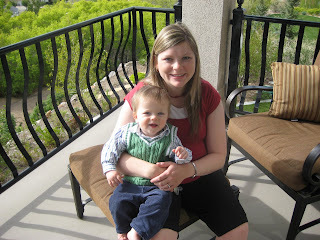 Me and Caden, the little boy who makes it possible to celebrate Mother's Day. 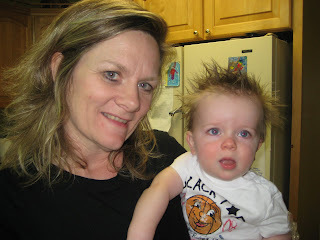 Grandma (Cameron's mom) and Cade. Happy Mother's Day! 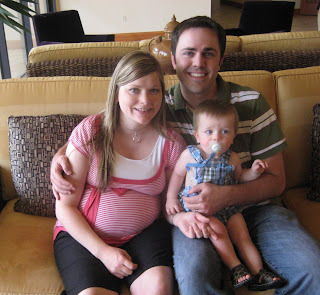 We got to go on a vacation to Scottsdale, AZ as a family one last time before we have our 2nd child. We left May 1st and got to stay until May 9th! 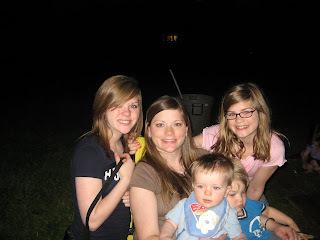 This was our longest family vacation ever! We had a great time! 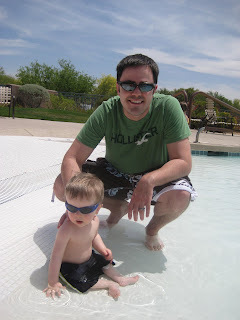 We spent most of our time at the pool. 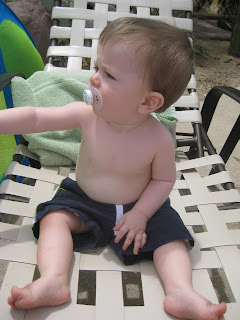 This is Cade sunbathing by the pool. 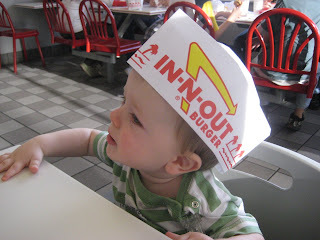 We also went to In n Out a couple of times. 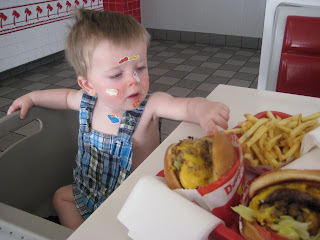 Cade loved their fries. Cameron and Cade at the entrance of the pool. Cameron was great with Cade, they had a lot of fun w/ each other. Me and Cade. He loved his crab float! 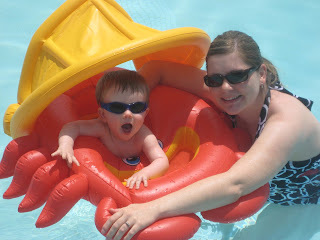 He especially loved being at the shallow end so he could walk around in his float. It was so cute. 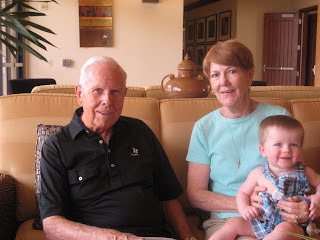 Papa Stan and Grandma Gale with Cade. 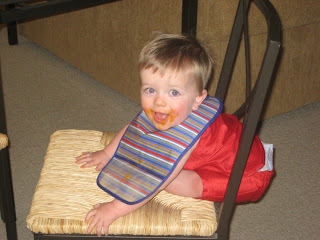 I fed Cade in this chair each day. This is how he ended up being one day. We had a few friends over our last night. 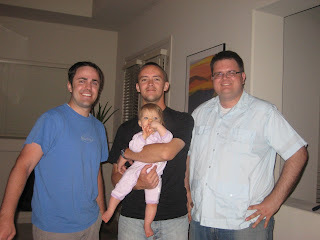 This is Cameron with one of his mission companions, Ricky and his daughter Abby, and their mission roommate, Brad. 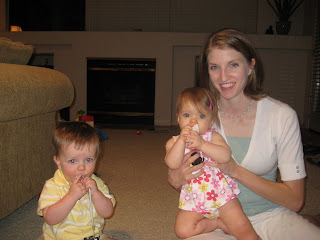 Cade, Nicole (Ricky's wife, she was also in my last student ward at BYU-Idaho) and their daughter Abby (she's only about 2 months younger than Cade). On our way home we got a flat, which added an extra 2 hours onto our trip. 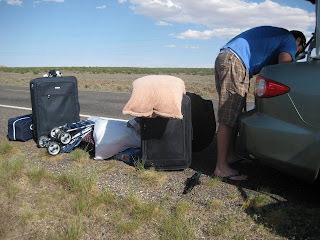 The extra time included: Cameron having to take everything out of the trunk to get to the spare, changing the tire, driving 50mph in a 65 mph zone because of the spare, and waiting about 45 min for someone to open their tire shop so they could replace our tire for us (this was on a Saturday after 6, everything was shut down). It took us about 12 1/2 hrs when it normally takes 10. We had a great, relaxing time on vacations. 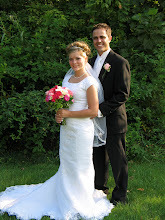 We didn't want to leave and get back to our everyday lives. But, we're glad we made it back home safely! 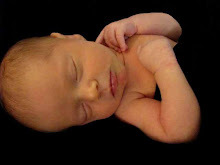 Cade and I went home and surprised most of my family members on Tuesday, April 21st. I wanted to go home to visit one last time before I have my 2nd baby and have to actually start paying for Cade's ticket (b/c you can only have 1 lap baby). Oh, and this was the latest my doctor would allow me to fly while being pregnant. There are lots of pictures, so enjoy! 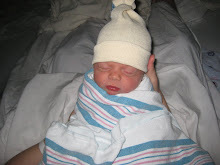 Daddy's b-day was the day we arrived (he's 49!) and he had no idea we were coming. It was great seeing the reaction on his face when he walked in the door and saw us. I love you Daddy! He couldn't decide what kind of cake he wanted, all he knew was that he wanted an ewwy gooey chocolate cake, so Momma made 3 different cakes. 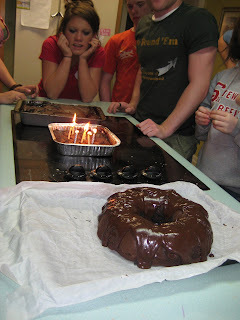 The bundt cake was the best! 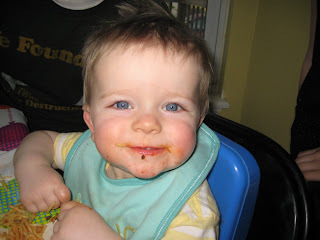 Momma made spaghetti for his Daddy's b-day dinner. 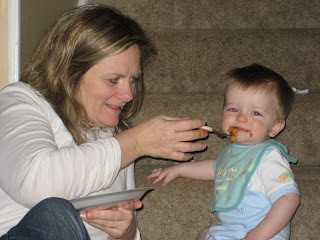 This was the first time Cade had ever had spaghetti, he loved it! 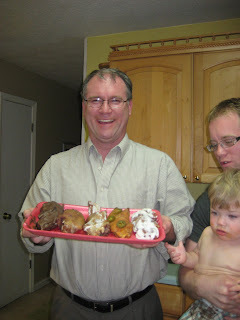 Daddy always jokes around about eating pigs feet, chocolate covered pigs feet especially. So, Bonny and Chad bought him some for his b-day. He didn't live up to his stories though, he wouldn't even try them! 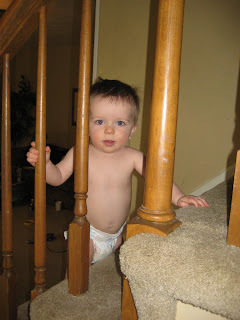 Cade learned how to climb stairs while we were there! 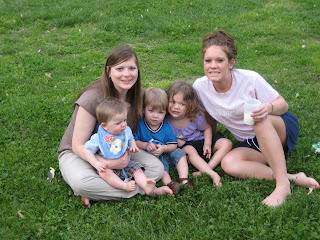 Cade and me with Bonny's cute little kids, Owen and Hallie, and my sister Seren. We had a bonfire in the backyard. This is us sitting by it with Hannah, Leah and Owen. 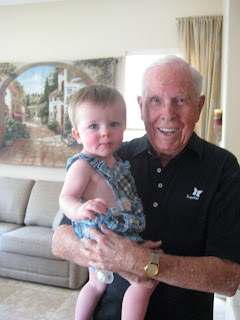 I love this picture of Owen and Cade. It kind of looks like a mirror. This is at Bonny's house. 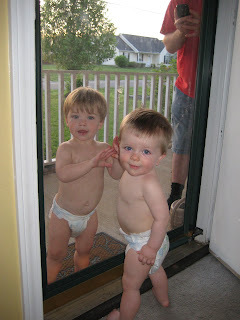 They stood at this door playing with each other for a long time. Sunday Cade was deprived of his naps because of church. By the time we left he couldn't keep his eyes open! 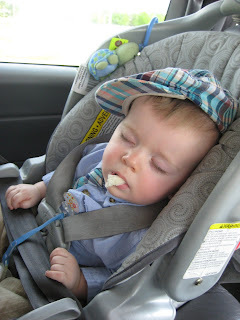 I didn't want him to fall asleep until we got home, so we tried to distract him by giving him bread. He just fell asleep with it hanging out of his mouth. We finally just gave up on trying to keep him awake haha. 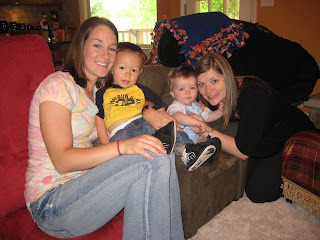 We went to visit my friend Danielle and her son Caleb in Brentwood. We had a great time with them. I love her house! 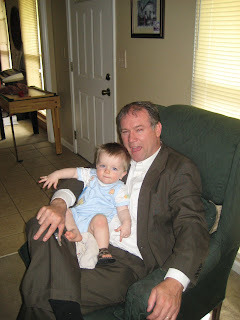 Cade absolutely loved his Grandpa! He got so excited and chased after him whenever he walked into the room. 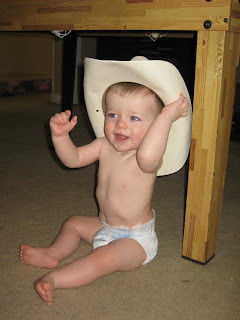 Dallas loves taking pictures with Cade, so I had to put one of the many pictures of them on here. Grandma (my dad's mom) came to visit us while we were there. Cade had a lot of fun with her. 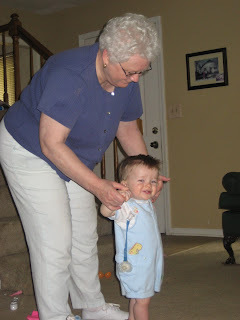 This is him "walking" with Grandma. Someone fixed Cade's hair for him, cute huh? 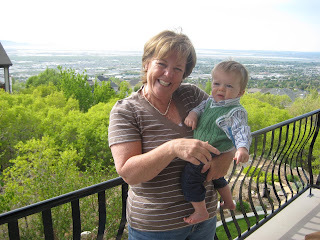 This is Gammy and Cade. 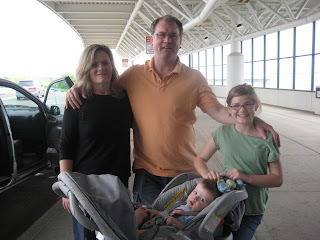 Momma, Daddy and Leah took us to the airport to see us off Wednesday, April 29th. We had a great time visiting. I was soo sad to leave knowing that I am not going to get to go home as often anymore. The only thing that made it bearable for me to leave was know that we were going to go to Arizona on vacation a couple days after I got back home (pictures to come). 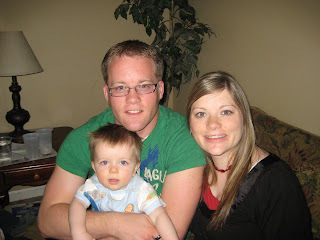 Having 2 kids is going to be very different :) Hopefully some of my family members can come and visit me instead, please!?!? Actually, Leah was such a big help while we were visiting that Cameron and I decided to have her come out for a few weeks during the summer to help me out with the kids. We are so excited to have her stay with us.